Years after first viewing Deborah Stratman’s O’er the Land, I remain haunted by the image of a billowing cloud. This dark blue-gray cumulonimbus, roiling and menacing, is accompanied by an incantatory voiceover detailing the story of Lt. Col. William Rankin, a marine pilot forced to eject from 47,000 feet who, on his long descent to Earth, was caught in the midst of a thundercloud and buffeted about for nearly 40 minutes, all the while bleeding profusely from veins busted by rapid depressurization. In my memory we are only shown a single, monumental cloud, but rewatching the film, I noticed Stratman strings together a series of similarly ominous images. Underneath this, a keening drone grows ever louder, and eventually outlasts the tale of Rankin’s descent as the clouds churn on. Given that the film begins with an answering machine message from a clearly aged Rankin kindly thanking Stratman for her interest in his story but informing her that he’s too old to be giving interviews, we know the voice we’ve heard in this sequence can’t be Rankin himself, and the language of the voiceover is so precise and rhythmic it’s clearly not the product of a documentary interview. (Those who note a quick early reference to Rankin’s 1960 book The Man Who Rode the Thunder might assume the words are drawn from there, but there’s no way to know for sure.) O’er the Land’s mesmerizing and unnerving centerpiece—not quite documentary, flirting with but not quite landing on fiction, and not fitting neatly into standardized definitions of what we consider avant-garde, yet potentially labeled by some as any and all of these—is representative of the whole film, which insistently complicates and collapses descriptions we traditionally employ to categorize our filmgoing experiences. It’s a rare and exciting feeling to exit a movie theater flush with the conviction that greatness has just unfolded before our eyes. As ever, the films that generate this strand of euphoria are few and far between, and should be cherished. Yet there’s also something to be said for works that initially puzzle and confound, but that slowly seep into one’s consciousness and latch on until they unexpectedly become our cinematic touchstones. Such is the ironic and quite sad lot of the cinephile: to be disappointed on most occasions, satisfied beyond belief a mere handful of times per calendar year, and, in many cases often left unaware of what will become part of her or his vernacular until much time has passed. I left my initial encounter with O’er the Land intrigued, but it didn’t immediately feel like the kind of film I’d still be grappling with four years later. I first saw Stratman’s medium-length feature (it runs a brisk 51 minutes, including credits) during the New York Film Festival’s Views from the Avant-Garde program in 2009. I wasn’t in the theater that day to see that particular title, or a work by that particular artist, having little knowledge of either. Rather, I’d been convinced by my Reverse Shot colleague Farihah Zaman (and also future filmmaking partner and wife) to spend a weekend digesting several programs of Views selections, the bulk of which I had little context for or advance knowledge of. We called it something of a late-year palate cleanse: the cinematic avant-garde, given that it often advances itself in the form of short and off-length works, and screens in contexts that fall outside the purview of most regular critics, is something that serious film writers need actively attempt to encounter and, once found, relearn how to engage with. O’er the Land was one of a few dozen films we caught that weekend, but it’s one of only a handful I think about with any regularity now. O’er the Land presents itself as a collection of disparate scenes: the inside of an RV, a border patrolman at work, a high school football game, French-Indian War reenactors, light dancing on leaves. These shots are generally all “nonfiction” in that Stratman points her camera on events as they happen as opposed to those staged for the express purpose of being filmed. The graininess and slight shudder of her 16mm imagery evoke a pleasurable sense of history. There are no “characters” in O’er the Land (to use a condescending term that should be immediately dropped from all cinematic nonfiction discourse), no narrative through-lines, nothing that obviously connects one sequence to the next. Things happen in a given location for a few shots in front a stationary camera, and then Stratman moves on. She only occasionally loops back for a reprise, her generally healthy distance from subjects and her predilection for tantalizingly oblique angles ensure a consistently varied visual experience. One of the first sequences establishes the subtler aspects of Stratman’s modus operandi: as we hold on a shot of leaves, a rustling announces a troupe of men in 17th-century military garb entering from frame left, muskets at the ready. There’s a crack of gunfire in the distance. In the next shot, the fife and drum corps strikes up a tune as a larger militia marches off. After this, full-on battle has been joined, replete with the pop of muskets and the boom of cannonry. As the fighting wears on, Stratman cuts to a shot of a crowd in modern dress, clearly spectators watching what we now realize to be a show. We’ve witnessed the transition of American history into pageant in the space of a single edit. One youth in the front row asks the camera, “Are we going to be on the news?” Then we see a gentleman in full Native American headdress and garb walking past a port a potty. There’s a bemusement in the advancement of shots in this sequence, but no sign of critique; just as we’ve gotten our bearings, she moves on to a high school football game at night, joyous and exuberant, but still underscored by the martial crack of drums. If her choice of title were not an immediate clue, it becomes clear as the film progresses that Stratman’s targets are American militarism and freedom in the age of the War on Terror (a sign announcing an elevated threat level placed in the middle of nowhere underscores one of the central ironies of the era). She visits the Knob Creek shooting range to watch men in camouflage run through a forest enacting their own war fantasies. The crack of guns rings out again, as people wait in line to rent a machine gun from “Bill” (as advertised on a handwritten sign) or get a Pepsi from the concession stand. Later we see piles of spent shells, almost beautiful in their tessellation on the ground. 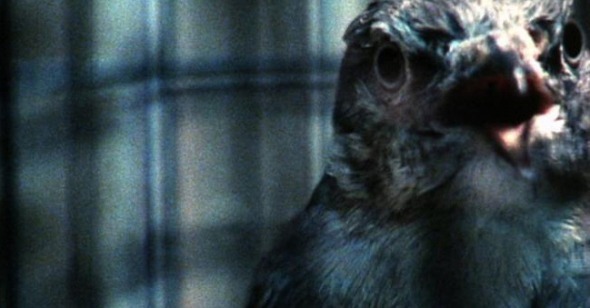 The film’s most frightening image is of a Stealth bomber, silently winging its way through the air (having myself experienced the uncanny sensation of that black wing moving quietly above, I was unnerved). American militarism is central, but it is possible to overstate its significance and therefore lose sight of the more expansive American portrait O’er the Land offers. When Stratman visits with an RV salesman, he notes the RV is a vehicle that can take “you away from everyday life and get you back to seeing nature”; inside the vehicle’s walls, one “can feel good about being an American.” O’er the Land implies this all is America. With an ever-increasing stream of documentary filmmakers chasing the tired models offered by the likes of Charles Ferguson and Davis Guggenheim, it’s easy to forget all the various forms nonfiction filmmaking can and has taken through the years. Stratman is clearly influenced by the patient landscapes of James Benning, and her film exists on a similar continuum as John Gianvito’s Profit Motive and the Whispering Wind, Lee Anne Schmidt’s California Company Town, and Travis Wilkerson’s An Injury to One, all of which employ static cameras trained on ambiguous imagery and some combination of bits and snatches of voiceover and overlaid textual material to advance their heavily left-leaning commentary. (Once upon a time these films would have just been called documentaries, but now they exist at some fringe borderline.) Yet, unlike those more politics-forward essays, Stratman’s film feels more akin to Harun Farocki’s observationally minded In Comparison (which also screened in Views from the Avant-Garde in 2009) in its studied ambiguity. Both films preceded the now common talk of hybrids, chimeras, and heterodox filmmaking by a few years, and both, while clearly bearing what might be best labeled an “agenda,” never stoop to cheap didacticism or lay their intentions fully bare. Based on the evidence of O’er the Land’s imagery, the U.S. is a nation obsessed with weapons, paralyzed by fear, caught in an endless feedback loop of fetishizing our own history. This sounds like pretty dire stuff, so why is it that O’er the Land feels remarkably free of stridency? Like Terrence Malick in To the Wonder, Stratman points her lens at a variegated swath of middle-ish America with nary of whiff of condescension—though she breaks from Malick at the point of awe (his low-angle shots of a Sonic drive-thru and a vast supermarket are almost religious; Stratman’s camera is stubbornly earth-bound). One of the gunners at the Knob Creek range notes wondrously about the shooting facility, “You see all the freedom and the history. There’s nowhere else in the world you could do this.” Men fight abroad so that men at home can play at soldiering for an afternoon; he doesn’t notice the irony, but Stratman doesn’t criticize him for it, and later, after evening has fallen, and guns have been replaced with flamethrowers, she even locates a kind of ethereal beauty in the firestorm, again leaving ample space for viewers to form their own responses. There’s an unexpected comic grace note toward the end of O’er the Land: after the credits begin to roll, Stratman cuts to a shot of three of the play-militiamen posing for the camera, the sounds of gunfire in the background. She tries to instruct them to stand as if she were taking an “old-timey” portrait. The men, confused, argue back with her, saying that they thought this was just a “still picture.” After Stratman calls cut and slaps her hands in the frame to mark sync (revealing herself as truly a one-woman filmmaking army), one of the men asks, “So wait, are you a director or something?” Stratman lets the sounds of gunfire overwhelm the soundtrack so that we don’t hear her answer. In the decade since we began Reverse Shot, I have been fortunate enough to have the opportunity to complete two feature films, both more or less straightforward documentaries. The first was deep in the edit when I saw O’er the Land, and the second is lurching across the finish line as I write this. Though neither really resembles Stratman’s work at all, the simplicity of her artistry inspires me while I’m going through the filmmaking process. O’er the Land felt like the right choice for this symposium—even though many argue we stand on the cusp of some new frontier in filmmaking, it reaffirms the power of the fundamental building blocks of cinema: the cut and the shot, creating rich, multiple meanings at their intersections. Perhaps this is why we keep going to the cinema, keep writing about it—no matter how they’re used, the fundamentals are always the same. There are certainly films from the first decade of Reverse Shot’s existence that I’ve loved more, films that have awed me with peerless technique or boundless empathy. But my mind has regularly wandered back to Stratman’s curious little opus, wondering always about the America that is contained within it. As often as I watch it, I’m still surprised at the order of the shots and discover striking juxtapositions to focus on. Sometimes it seems more political, sometimes less. I’m never sure exactly just what it is, what to call it, how to explain it. In this sense of confusion I have forged with O’er the Land one of the more continually pleasing cinematic relationships I can recall, one which, if I can replicate it a few more times in Reverse Shot’s second decade, will give me ample hope and excitement for the prospects of our third.